BUSC 2000 was the first of the modern BUSCs. Organised by Manchester Metropolitan University (or was it still a polytechnic back then? ), the committee took a business-like approach to sponsors and students alike. Companies were starting to wake up to the value of the student pound, and BUSC 2000 was the first to attempt to monetise it. This poster – designed by their media partner, Fall Line Magazine – sums up the new approach: professional and slick, with top line sponsor, The Daily Telegraph, partnering Salomon, Switzerland Tourism, Animal, Natives and perennial BUSC tour operator Wasteland. Of course, as BUSCateers from back in the day will know, for whatever reason (cold feet?, contractual errors? ), this poster is also an anachronism. 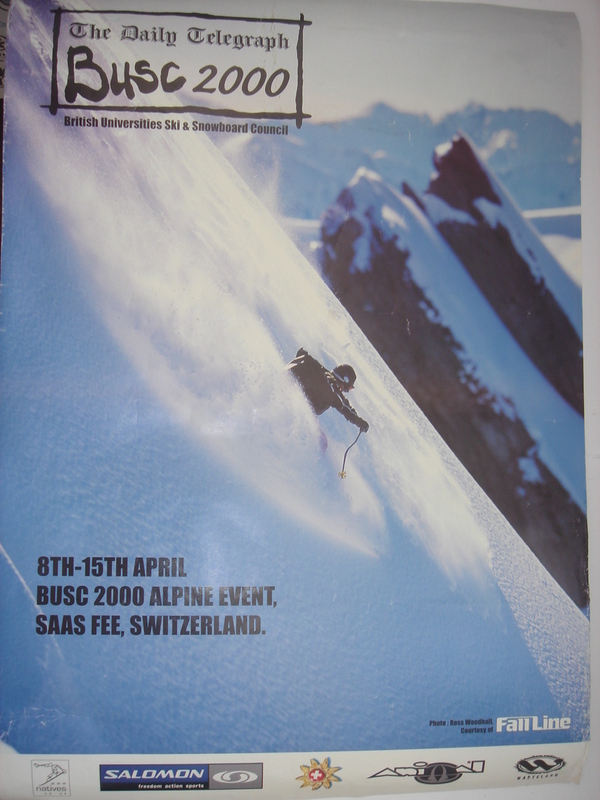 BUSC 2000 never went to Saas Fee, instead ending up happily in Saalbach Hinterglemm. The truly modern BUSC had to wait another few years. Ahh yes this happened a few years before we bought in Saalbach but these trips were legendary. 2000 was racing Spar shopping trolleys down Hinterglemm high street in the early hours and 2001 some students burnt down part of an apartment complex. I’m not surprised it took the locals a while to get to know us – we arrived while the memories were still fresh.